Some programs require physical signatures to be compliant with licensing. Kinderlime's Parent Signature feature will allow you to collect signatures from parents when they pick-up or drop-off their child. 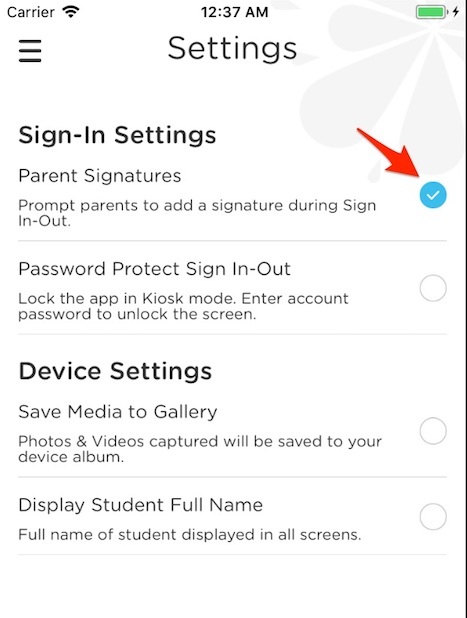 In the App, go to the Main Menu, select "My School" and then "Settings" and click the "Parent Signatures"
On the website, go to "School Settings" and click "Settings" to enable "Parent Signatures." On the website, go to "Reports" and download the "Daily Attendance" report. You can select the date and room (or All Rooms) and click "Generate Report." 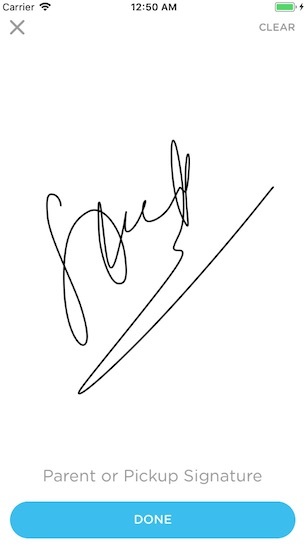 Download the PDF to see the physical signatures. Another report option: For a report that has all of the signatures for a given student for a selected time period, go to My School --> Students, click on the student's name and use the calendar icon beneath their profile picture to export a copy of their monthly sign in-out records with signatures. Want to transition away from collecting signatures? Most licensing agents will accept Kinderlime's unique pins as signatures as long as there is a waiver on file with them. Click here to download the waiver template.